We're renters—at least for now. When we moved into our apartment, we noticed that the property owners seem to be stuck in the "brass age." You know . . . brass chandelier in the dining room, old-style brass folding fireplace screen, brass hardware, etc. Nice. Now, maybe I'm being a bit judgemental of you brass-lovers out there, but it's just not our style. We're planning on moving from this apartment in the next few months or so, but I've been itchy for a crafty/creative project. Our little one was born just after we moved in, so we never painted or did anything to really make it our own. Something had to be done. Step 1 was to add some artwork to our bedroom, above our bed. You can see what I did here. I did this VERY cheaply by using some black frames and cream mattes that we already had, taking my own pictures, and customizing them using Adobe Photoshop (available for WIndows or Mac ). The entire project only cost me around $27—the cost of developing the prints (I had several done at the same time). Ain't she a beaut?! It's a thousand times better, now. Have I inspired you? I hope so! For just under $6, we have a brand new lamp that fits our style and is amazingly less obtrusive than that old brass thing. And for a grand total of under $35, we have really attractive artwork in our bedroom, and a totally new, updated, classy feel in our dining room. I love the new look! I really need to update some of our light fixtures and I just love how yours turned out! Great Job! I am impressed---mainly because you DID NOT TAKE THE Fixture OFF! Now, thats my kind of improvement. (we're not handy either) I LOVE how it looks, great job! A major improvement, good job! WOW, I'm loving the transformation! This is awesome. It's inspiring me - no joke! I have wanted to put some framed pictures of the mountains of my home over our bed. Now that I know I can do it this easily, I'm getting on it! AND, how well do you think the paint sticks to the chandelier? The former owners of this house loved the brass, too. We have a bathroom I'd love to take it out of. Wow! That's an awesome re-do! Thanks for sharing! Score! It looks fabulous! I once redid a brass chandie for my daughters room. Imagine my surprise when it crashed to the ground! What a great redo! Looks brand, spankin' new! 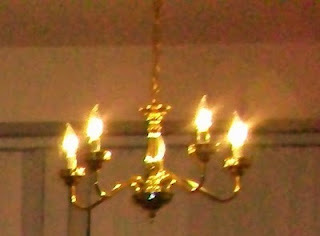 I have brass light fixtures too and am itching to paint them, and I also cringe at the thought of taking them all down. I actually found a can of paint at Home Depot that's supposed to do the same thing as the bronze or black spray paint. Will have to give it a shot! Absolutely gorgeous! I just bought a $15 chandelier yesterday. Can't wait to get on it!